Nestled in a forested hillside along the Brandywine River, 60 Bragg Hill blends contemporary design with West Chester’s agrarian aesthetic. 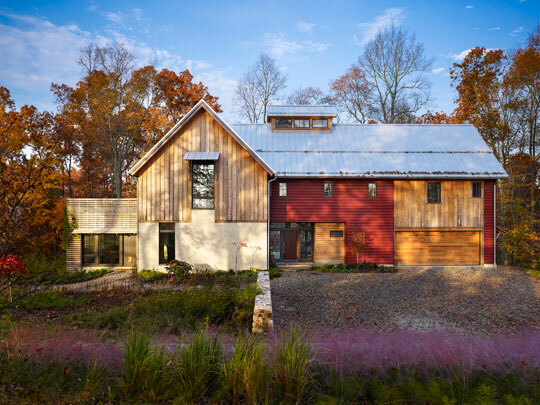 Owned by Barney and Dr. Nancy Leonard, this farmhouse chic home designed by Matthew Moger of Moger Mehrhof Architects (MMA) maintains a minimal environmental footprint through its passive and active building systems, use of local building materials and intricate site design. The building’s solar electricity, geothermal heating and cooling — offset with radiant floors and natural ventilation — exemplify how sustainably-minded architects like Moger consider the building’s context, inner workings and livability. “The future is moving toward designing more insulated [building] envelopes to minimize the need for costly mechanical systems and minimize energy use,” explains Moger. While building-envelope design generally applies to new construction, existing buildings can incorporate options like recycled materials, natural lighting and green roofs in renovations to lower environmental impacts while creating a more livable home. For tips on green building systems and eco-home design, and more about the building of 60 Bragg Hill, visit 60bragghill.com. Story by Lauren Mandel, photos by Jeffrey Totaro courtesy of Moger Mehrhof Architects.